ok, so theres those BB full autos but those take lots of air because the BBs have to penetrate cans to be worthwile (cool). Imagine a "pop-it" full auto! 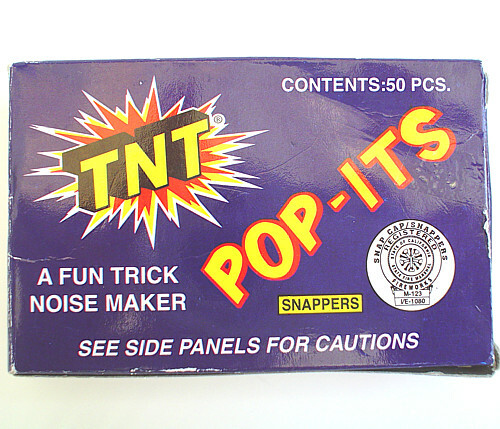 you would only need enough air to make the popit fly 20 feet or so and then it would explode... full auto! ANY IDEAS?! ive been playing arounds with popits and a blowgun and you can kindov make a little dart out of popits with tape, spend a little maore time and you could probly make bullets that could be magazine fedd. you coud cut the tail off and make them balls. Idealy you would just want a big hopper you poured boxes of popits into.. but that might be too out there. Im just throwing out ideas here.... just think how cool this would be. LOCKED BY PIMPMANN22 (as always other mods/admin, feel free to unlock at anytime) For now this topic is locked. Fireing fireworks out of a cannon is not allowed. Second this is a place to post your topic if it gets bad comments on Spudtech. Third the kicker, it wont work. there very light, i dont think they will go very far, you could use a cloud system. ps: are you off rotteneggs.com? I posted this in the wrong thread originally a couple days ago and didn't notice it at all. I unlocked this thread because it isn't as bad as some make it sound. Just don't be a dumbass. I have found these to be best in my tiny combustion. 5" long 1" chamber, propane-injected, 12" long 1/4" barrel I think, maybe 3/16" or 7/32" or something. It's pretty fun tossing those little poppers accross the room towards unsuspecting victims. i doubt 1000 boxes would ignight a fire. Well if he had gasoline or something on it then MAYBE. Let's stray from these fire discussions though.